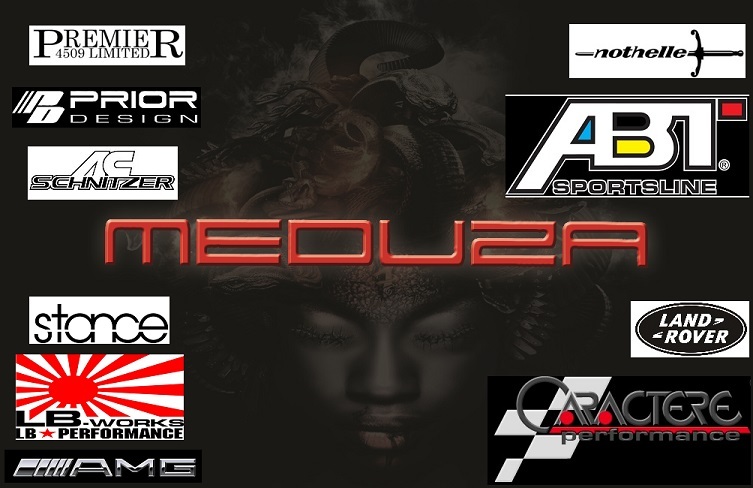 Meduza specialises in body kit parts, offering a huge range of body kits, spoilers, car grills and fenders. We stock genuine and aftermarket bodykits from the world's leading manufacturers, including Ibher Design, Carzone Specials, Carcept, Kahn, Caractere, ABT, Mansory, Prior Design, Landrover OEM and more. For the ultimate modification, buy the finest bodykits available for all car makes and models, direct from Meduza. Meduza Audi A3 8P RS Bodykit Parts description : Complete front bumper including mesh package All parts can be installed and painted at our Leicester bodyshop. Meduza Audi A3 8P RS Bodykit Parts description : Complete front bumper Complete rear bumper Pair of side skirts Complete 3D mesh package All parts can be installed and painted at our Leicester bodyshop. Meduza Audi A3 RS3 Style Front Bumper 2017 Parts Description : Complete Front Bumper Front Grille in Gloss Black Under tray fixings This product can be installed and painted at our Leicester Body Shop. Meduza Audi A4 B7 04-08 ABS Plastic Boot Spoiler Car Body Dynamics are a leading supplier of ABS plastic front bumper extensions, rear bumper extensions, sideskirts and spoilers. Meduza Audi A4 B7 04-08 ABS Plastic Front Lip Car Body Dynamics are a leading supplier of ABS plastic front bumper extensions, rear bumper extensions, sideskirts and spoilers. Meduza Audi A4 B7 04-08 ABS Plastic Headlight Eyebrows Car Body Dynamics are a leading supplier of ABS plastic front bumper extensions, rear bumper extensions, sideskirts and spoilers. Meduza Audi A4 B7 04-08 ABS Plastic Rear Lip Car Body Dynamics are a leading supplier of ABS plastic front bumper extensions, rear bumper extensions, sideskirts and spoilers.